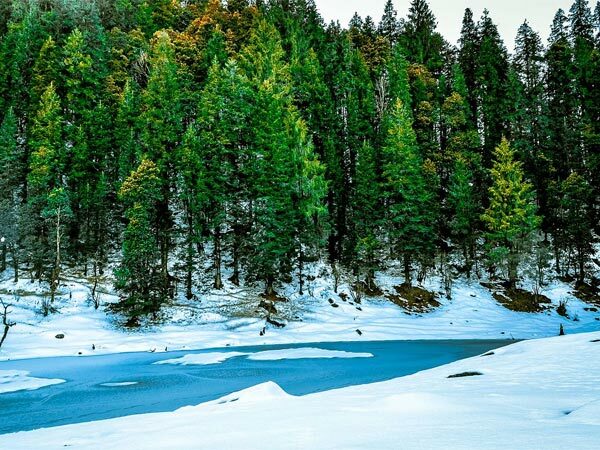 »Kedarkantha – An Alluring Winter Trek! Kedarkantha – An Alluring Winter Trek! Kedarkantha is one of the best Himalayan treks in India. The astonishing part of the trek is that it is one of the rare treks which has a good number of clearings; if it's winter, these clearings are filled with white powdered snow as far as your sight runs. Thus, they make impeccable locations for camping. The drive from Dehradun to base camp passing through enchanting locations of Mussoorie, Purola and Mori will make you drool over nature, leaving you to yearn for more. Surrounded by mountains and snow all through the trek, one is bound to bask in the glory of nature. It takes about 7 days to complete the feat to reach the altitude of about 12,500 ft above sea level. If you are a beginner, then Kedarkantha is the perfect trek for you with the difficulty level being easy to moderate. Not just this, you will get a chance to see some of the famous summits. The view that you get from here is breathtakingly fabulous. This picturesque summit will change your insights and facts about the exquisite beauty that our country is bestowed with! The winter snow sets in December and lasts till the last week of April. You start and end with snow all through the trek. How To Get To Kedarkantha Trek? By Air: Jolly Grant Airport is the airport serving Dehradun. It is well connected to major cities. By Train: Excellent railway network connects Dehradun to other important cities like Delhi, Mumbai, Varanasi, Mussoorie, Lucknow and Kolkata. By Road: Dehradun is easily accessible to major cities of the country. NH 72, NH 72A and NH 58 are few national highways connecting to Dehradun. Nature has charming ways to enfold its beauty. The trekking groups will make your cab arrangements from Dehradun railway station to Sankri. On your 180 km drive to Sankri, roads filled with twists and turns will pass through Mussoorie descending into Tons River Valley. Take a halt at Kempty Waterfalls to rejuvenate and feel the freshness of chilly hilly waters. After crossing the towns of Purola and Mori, your level of enthusiasm will double as you come closer to the view of snow-capped mountains. Sankri (6,400 ft) serves as a base camp to lot many treks in Uttarakhand including Kedarkantha. If you are lucky enough, you are likely to see snowflakes in the form of white rain, right from the base camp! After an overnight stay at Sankri and some scrumptious breakfast, you can start early for Juda Ka Talab. After crossing thick pine forests, you will cross steep climbs on and off. At an altitude of 9,100 ft, you will find yourself surrounded by a large lake on the left that was once two lakes but today conjoined as one; to your right rests thick forests of oak and pine. You will get a chance to walk on a frozen lake and play games over it if you happen to visit during winter months. An ideal place to camp, Juda Ka Talab will give you a perfect opportunity to sleep in the clear skies, under the blanket of stars. The trail ahead to reach an altitude of 11,250 ft is straightforward and clearly visible. The dense forests continue till you surpass the steep climbs. There are few shepherds who reside on the hills. Passing through stretched meadows and dry oak forests, the enchanting views of arc shaped range of snow-capped mountains comprising of Bandarpoonch, Swagarohini, Kala Nag and Ranglana will mesmerise you with their magnificence. You are now just 1,000 ft away from the summit as you arrive at Kedarkantha base camp. It is preferable to start early from the base camp. Witnessing early morning orangish golden rays gleaming over the snow is an ultimate experience altogether. The Kedarkantha peak can be evidently seen from the base camp. Opt for the northern ridge. You can take southern ridge as well during winters as it has comparatively less snow and makes climbing easier. After trekking for almost an hour, you will see a Trishul that marks the arrival of The Kedarkantha Summit! Spend some time amidst the snow and relish spectacular views of Chandrashila Pass and Kinnaur Kailash ranges. The aerial view of Gangotri and Yamunotri from an altitude of 12,500 ft is to die for! Descend from the summit passing the oak forest, pine and frozen streams to reach Hargaon campsite. Located at an altitude of 8,900 ft, Hargaon would be the last campsite. Descending from the campsite brings you to a trail that evens out through the pine forest to come to a ridge. From this ridge, you will be greeted by the vast stretch of Har Ki Dun valley. Going further will bring you to potato, apple and cauliflower farms, situated adjacent to the huts of local farmers. Flora, fauna and other blossoms in the Himalayas are distinct enough to keep you hooked to your camera!